English pop-rock band formed by ex-Genesis member, Mike Rutherford in 1985. As of 2011, the band features Mike, Andrew Roachford and Tim Howar. Previous members have included Paul Carrack, the late Paul Young (of Sad Cafe NOT the pop-singer) and Adrian Lee. 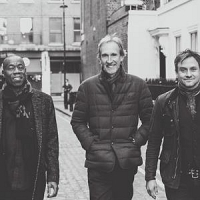 They released their debut album, "Mike + The Mechanics" in 1985, followed by: "Living Years" (1988), "Word of Mouth" (1991), "Beggar on a Beach of Gold" (1995), "Hits" (1996), "Mike & The Mechanics" (1999), "Rewired" (2004), "The Road" (2011), plus 2017's: "Let Me Fly". Their most familiar songs include "All I Need Is A Miracle", "The Living Years", "Over My Shoulder" and "Now That You've Gone".